East West Players invites you to “One Night Only: EWP Night Market” on Saturday, Sept. 15, at the David Henry Hwang Theater, 120 Judge John Aiso St. in Little Tokyo. EWP’s season kick-off event will include tasting stations with dishes from local restaurants, followed by an evening of performances featuring stellar Asian American talent. All proceeds support EWP’s mainstage and educational programs. The evening’s honorees are actor Gedde Watanabe and Los Angeles County Supervisor Mark Ridley-Thomas. VIP early access at 5:30 p.m.; general admission at 6 p.m.; performances begin at 7:30 p.m. For more information, visit www.eastwestplayers.org. Mouzam Makkar can be seen playing the series regular role of Loni Kampoor in the new ABC drama “The Fix,” co-written by Marcia Clark, premiering in 2019. She was last seen in the series regular role of Britney in the NBC comedy “Champions,” created by Mindy Kaling and Charlie Grandy. Other TV credits include recurring roles in “The Exorcist” (Fox), “The Vampire Diaries” (CW), “The Following” (Fox), and “Chicago Fire” (NBC). Film credits include “She’s in Portland” and “Freelancers Anonymous,” both premiering in 2018. Rachna Khatau is currently recurring on “Bizaardvark” (Disney), and recently appeared on “The Big Bang Theory” and a comedy pilot, both for CBS. Previously, she was seen recurring as Sondra on “Baby Daddy” (Freeform). At EWP, she was in the world premieres of “A Nice Indian Boy” and “Washer/Dryer.” She was published in “Good Girls Marry Doctors,” a book of essays by South Asian American women. Her two-woman sketch comedy show, “MR.,” has performed to sold-out crowds in Los Angeles, Austin, and Chicago. Tess Paras is a Los Angeles-based writer and actress. She currently recurs as Jayma Chan on the CW’s “Crazy-Ex Girlfriend” (featuring the first Filipino American family on TV) and is most recognized for her role as Dana Tomas on NBC’s hit drama “Grimm” (introducing the first Filipino American storyline on primetime television). She also starred in the ABC Digital sketch comedy series “The Gaggle” and recurs on “Take My Wife” on Seeso. She wrote and produced for Fusion Comedy, the digital comedy pod of the Fusion cable network. Deedee Magno Hall is an Ovation Award winner for lead actress in a musical for the role of Diana in EWP’s “Next to Normal.” She is currently the voice of Pearl on Cartoon Network’s “Steven Universe.” Theater credits: “If/Then” (Broadway and U.S. national tour), Kim in “Miss Saigon” (Broadway, second U.S. national tour and Asian tour), Nessarose in “Wicked” (first U.S. national tour), Mrs. Walker in “The Who’s Tommy” (EWP). TV and film credits: Original cast of Disney Channel’s “New Mickey Mouse Club,” “Third Watch,” “Dellaventura,” “Rear Window,” “Face,” “Sister Act 2.” Recordings: Original member of Hollywood Records’ pop group The Party and co-founder of mommy singing group Mama Bares. Paulette Ivory, born in Britain and based in L.A., originated the role of Nala in London’s “The Lion King” and played the title role in Elton John and Disney’s “Aida” on the national U.S. tour. She was nominated for a Helen Hayes Award for best lead actress and won a Carbonell Award. She performed at the Kennedy Center after being nominated for her role as Aida. Other theater credits: “Fela” (Broadway, National Theater U.K. and world tour) playing Sandra Izsadore, produced by Will Smith, Jada Pinkett Smith, and Jay Z; “Purlie” (NAACP nomination for best lead actress); “Ragtime Sarah” (L.A.); “Blues in the Night” (U.S. and London); “A Woman of No Importance” (Royal Shakespeare Co.); “Baby It’s You”; “Smokey Joe’s Café”; “The Hot Mikado.” TV/film credits include: “Criminal Minds,” “The Young and the Restless,” “Numb3rs,” “Girlfriends,” “Strong Medicine,” “Doctors,” “Eastenders,” “Lords pf Dogtown.” Ivory wrote and starred in her first short film, “In Destiny’s Hands,” and has a web series called “My Life Lesson.” She was honored with the key to the City of Birmingham, Ala., while performing as Aida. Marcel Licera is a former National Teen LEGO Brickbuilder Champion of the Philippines. He recently performed in “Joseph and the Amazing Technicolor Dreamcoat” (Jacob/Potiphar) and “Beauty and the Beast” (Cogsworth). Last year, he was in two Stage Raw top 10 picks: “Pacific Overtures” (Lord Abe) and “FUGU” (originated the role of Capt. Matsuoka). Selected notable roles: Lion (“Wizard of Oz”), King (“King and I”) and Engineer (“Miss Saigon”). Offstage, he’s a USPS mailman and on hiatus as an MFT intern. Anthea Neri is an actress, singer, human empowerment ambassador, and the co-host of “Pretty Rich Podcast.” She is honored to have been a part of EWP’s Ovation Award- winning musical “Next to Normal.” Recently, she has appeared in “VOTE” at The Rockwell; “Iceland” at the Ford Amphitheater; a reading of the new rock musical “Tiananmen,” directed by Stafford Arima; the award-winning “Calico Buffalo”; and the off-Broadway comedy “Discenchanted.” She has performed at Carnegie Hall Lincoln and Center, and is proud to have worked with David Byrne, Fatboy Slim, Tony Award-winning Alex Timbers, and Broadway legend Baayork Lee. Araceli Prasarttongosoth made her broadcast TV debut last year on the Season 1 finale of “Lethal Weapon” on Fox. This year, you may have seen her with George Takei in the short film “American” or as Ngana in the McCoy/Rigby production of “South Pacific” at the La Mirada Theatre. This fall, she will recur as Kim on the animated series “Super Wings” on Universal Kids. She is always happy to be back at EWP, her theater home since “The Who’s Tommy.” She attends a Mandarin dual-language immersion school and is working toward her black belt in hapkido. Forrest Wheeler turned his attention to the world of making people laugh at the age of seven in one of his earliest acting jobs, “The Incredible Burt Wonderstone,” playing opposite Steve Buscemi. He performed on commercials and TV/web series “Community,” “Mortal Kombat: Legacy II,” “Disney Jr. Sophia the First” before landing a role as a series regular on the ABC hit comedy series “Fresh Off the Boat.” He plays Emery, the cool, sportive, romantic, and lovable middle child of the Huang family. In 2015, he was nominated for Best Child Actor of the Year by Vulture TV Awards. In the same year, Entertainment Weekly included Forrest in “12 Under 12: The Best Child Actors of 2015.” Recently, The Hollywood Reporter named him among “Hollywood’s Top 30 Stars Under Age 18.” When Forrest is not filming and studying, he loves to participate and advocate for charity events benefiting children in need. Hudson Yang has named by Variety, The Wrap and other entertainment media as a rising star to watch in young Hollywood. He was cast as Henry in the independent feature “The Sisterhood of Night” (2014) and then tried out for “Fresh Off the Boat,” leading to his unexpected big break playing the irrepressible protagonist, Eddie. Over the course of four seasons to date, his performance has garnered him multiple NAACP Image Awards nominations for Outstanding Performance by a Youth, and Teen Choice Awards nominations as Choice Scene Stealer in 2016 and Outstanding TV Comedy Actor in 2017 and 2018. 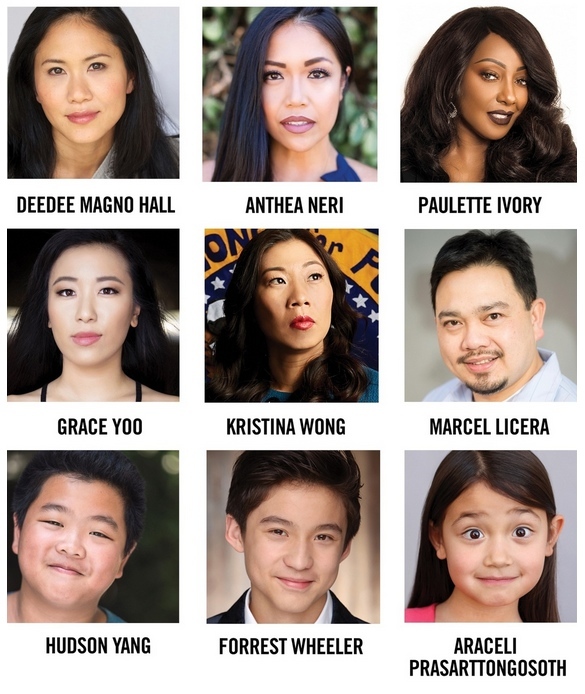 Yang has also appeared on “Family Guy”; Disney’s “Sophia the First,” “Liv and Maddie,” and “The Lion Guard”; and PBS’ “Cyberchase.” He starred in indie rapper Jason Chu’s acclaimed music video “Marvels” as Chu’s younger self, and was cast in “Orange Is the New Black” co-executive producer Lauren Morelli’s directorial debut, “Hum,” opposite Samira Wiley (Poussey on OITNB).